The day started well with clear skies and sunshine. The plan was to go for a walk in the morning and paint below the gunwale in the afternoon when the steel would be warm and dry. Good plan…. but the weather let me down. Fortunately I wore a thermal vest and took a shower coat. 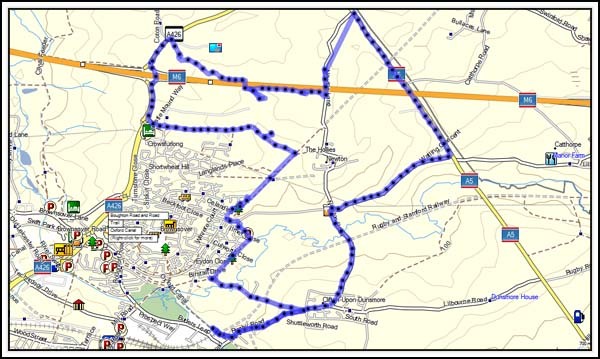 The route for the walk had been planned in such a way that I’d collect data on a footpath not currently on the OSM. In the end I covered most of the general area during the walk but collected no data. The reason why no data was collected was because I couldn’t find the footpaths despite them being on the Ordnance Survey map. The route took me over and under the M6 motorway twice and then down the busy A5. None of this was planned. The first quarter of the walk took me through a common to the east of a new housing estate in Brownsover. There is a large industrial/factory complex in the area at the top right corner of the map. An extension to the complex is currently under construction and I was surprised to find some long term improvised moorings between the existing and future factories. A line of modern caravans have taken over the new sealed cycleway. I suspect many of the caravans were foreign as they had the door on the right side rather than the left. The towing vehicles were also modern and mostly vans. The rear doors were open on one and it was obviously full of “carryover” chattels. The road is currently a ‘dead end’ so they are not obstructing the cycleway. But I was disappointed with the volume of discarded rubbish. I’d been silently congratulating the locals for keeping the footpaths clean of litter until I reached these caravans. They are being lived in with generators, water containers and gas bottles on display. I assume these are what are referred to as “Travellers”? Never seen anything like this in NZ or Australia! By the time I was ¾ the way through the walk I was starting to feel cold, wet and rather sorry for myself. “Who’s stupid idea was it to voluntary walk in this weather?” St Thomas’s Cross looked very inviting but I pressed on. 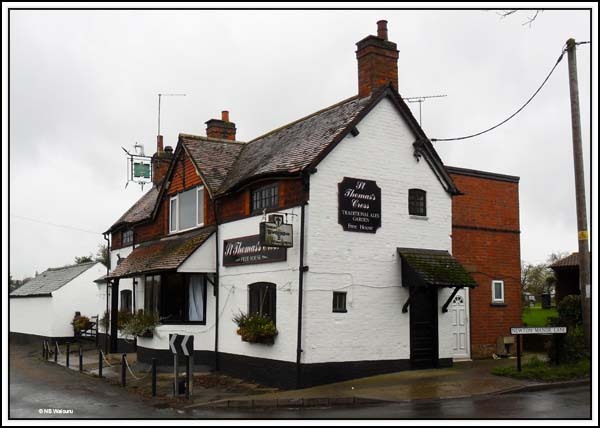 I was actually quite surprised to find the pub at a crossroad all on it’s own. There are no dwellings in the immediate vicinity which made me wonder where their patrons lived? The last three kilometres were rather miserable as the slow but regular rain was bringing the sweat from my scalp down into my eyes. I should have taken a hat! Of course there was to be no painting in the afternoon. Perhaps tomorrow! Meanwhile, Jan has completed sewing another porthole bung cover. Trying my best not to make 'racist comments' as is often the accusation when talking about the caravans you saw today, but you were correct - they were travellers, now recognised under British Law as an ethnic group. 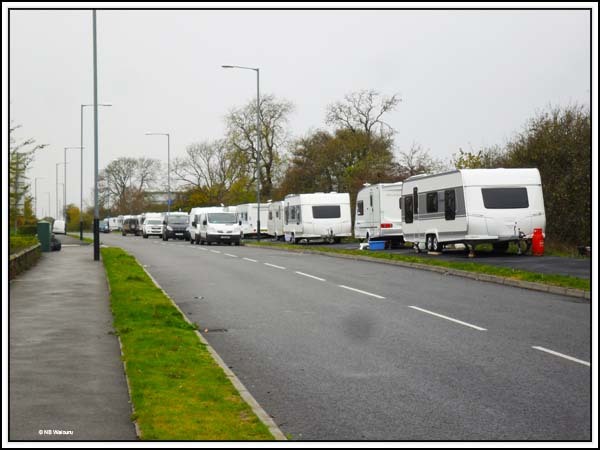 Irish travellers, English Travellers and not to be confused with the first two, Romany travellers, move around Europe, Asia, and now even Australia, making camp pretty much where they like, often to the annoyance of the local community. Often though, they don't help themselves in this regard, as they often discard copious amounts of rubbish which is left for others to clear when they move on. Many of them also support their (untaxed) incomes by unlawful means, which, to put it simply, annoys the hell out of tax paying individuals, Police and local authorities alike. They favour the 'Hobby' brand of caravan, which, being a German make, has the entrance door on the other side to an English van. Their liking for this brand also has security implications for owners who use them only for holiday use, sometimes finding their pride and joy has been 'spirited away' by visitors in the night. Holiday camp site owners often won't allow Hobby caravans on their sites under any circumstances due to the following they have by the travelling community. Whether justified or not - that is not for me to comment on, the travelling community are often the subject of prejudice by who they refer to as 'country people' or 'settled people', or in the case of the Romanies, 'Gorgias', - that's those of us who own houses and pay taxes.